Services available 24/7. 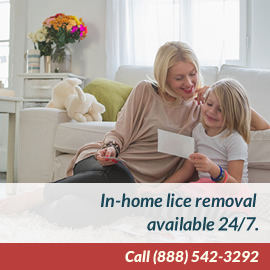 Call 888-542-3292 or 888-LICE-AWAY. We can come to your house right away! LTC®-certified technicians come on-site to you, providing quick and compassionate head lice removal in homes, schools, camps and other venues. More than 30,000 clients nationwide have benefitted from LTC® treatment services to date. Pediculosis, or head lice infestation, affects millions of children and their families each year. Because screening and early detection are the best weapons, LTC® offers a Lice Insurance® screening program in schools and camps that ensures lice-free environments for kids. These preventive services have been extremely successful, with all sites that have signed on for the program currently under annual contracts. LTC® technicians use Jolis Cheveux™ by LTC removal and prevention products that have been formulated in-house by company co-founder Dr. Elin Cohen, a board-certified pediatrician and mother of two. Dr. Cohen developed the products with natural active ingredients as non-toxic alternatives to current lice removal products on the market, many of which contain insecticides, such as permethrin. Besides being potentially toxic to children, insecticide-based formulations are becoming ineffective due to head lice becoming genetically resistant to the ingredients.